GENEVA, SWITZERLAND – A US-based human resource consultancy firm has ranked Switzerland as the most expensive country for expatriates with three Swiss cities among the top 10 most expensive for international workers. Mercer, which carries out an annual survey on housing, transportation, food, clothing, household goods, and entertainment in 211 cities around the world, published its report in early July. 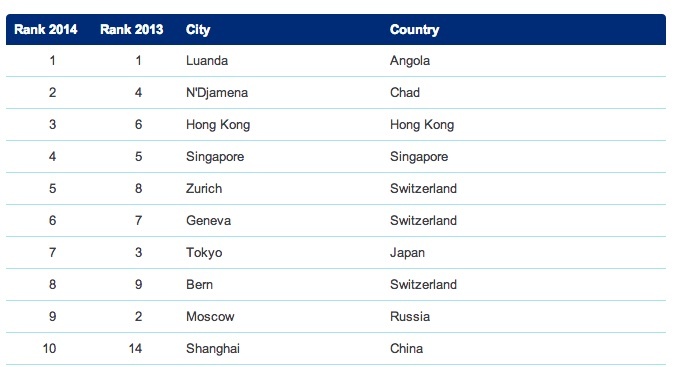 Mercer’s 2014 cost of living report – derived from a March 2014 survey – cites Luanda in Angola and N’Djamena in Chad are the two most expensive cities in the world for expatriates due to the rise in their local currencies. The Swiss franc’s strength against the US dollar was also a factor in Switzerland’s high-rank. The top 10 most expensive cities include four in Europe, four in Asia and two in Africa. Zurich (5) is the costliest European city on the list, followed by Geneva (6th) and Bern (8th). London climbed 13 places and is now 12th in the list of the most expensive cities, followed by Copenhagen (15th) and New York City (16th). The list is used by many companies to determine the salary and benefits package offered to employees working abroad. Full report: 2014 Cost of living survey.